Wall Street's nice comeback fell short of motivating Aussie bulls. Downward pressure to increase below 0.7150, Friday's low. 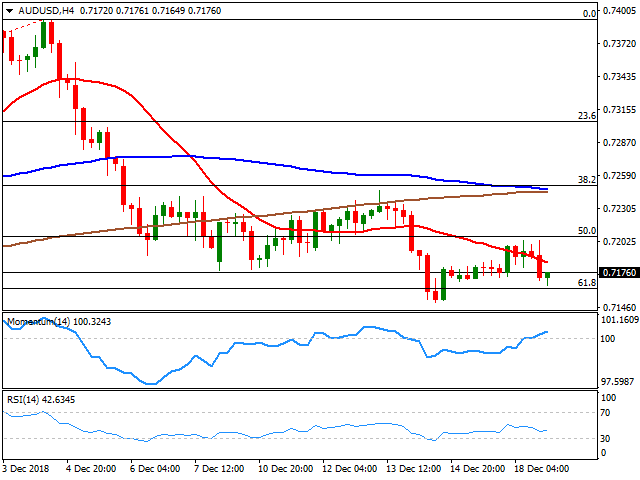 The AUD/USD pair traded uneventfully for a second consecutive day, with an early advance meeting sellers around the 0.7200 level and a Fibonacci support around 0.7160 limiting declines. The Aussie remained under pressure amid the sour tone of equities bouncing just modestly on Wall Street's recovery, although as most commodity-linked currencies, collapsing oil prices play against it. Also, the RBA Meeting Minutes where mostly dovish, as policymakers seem less confident about the economy with persistent downside risk coming from slow income growth, high debt levels, and falling house prices. Nevertheless, the document reiterated that the next move in rates is more likely to be a hike. Australia will release early Wednesday the November Westpac Leading Index previously at 0.08%. As said, the pair is bouncing from the 61.8% retracement of its latest bullish run from the year low to 0.7393 at 0.7160, with a more relevant support being 0.7150 where it bottomed last Friday. In the 4 hours chart, the pair briefly traded above a bearish 20 SMA but ended below it, while technical indicators aim modestly higher, the Momentum around its mid-line and the RSI currently at 43, indicating that bulls are far from interested. A relevant resistance comes at the 50% retracement of the mentioned advance, located at around 0.7210, with bulls probably being a bit more courageous on a break above the level.